Ringtones are a multimillion dollar industry, but did you know you can easily create your own? If you have an iPhone and a copy of Garageband it only takes a minute. This video goes step by step through the process. Songs purchased from iTunes before April 2009 will not show up in the Garageband Media Browser. Up until April 2009 Apple used DRM (Digital Rights Management) on all of their music files. This restricted the files from being played on more than 5 computers and from being edited or manipulated. It was put in place because the music publishers wanted to prevent piracy. But the reality was that there were a lot of different ways for pirates to get around this (for example burning the music onto a CD then importing it back into iTunes). So Apple managed to convince the music publishers that the DRM was only making it more difficult for good people (like you and me) to use the music they purchased legally the way they wanted to. When did this happen? You guessed it on April 2009. So, you're probably thinking, "Great, how do I update my old music files so they are DRM free? I bet it's only a button. After all with iCloud I can re-download my music anytime, I know, I'll just do that!" Unfortunately that won't work. You see, at the same time Apple dropped the DRM they created a new service called iTunes Plus which offered songs DRM free and at a higher audio quality. These songs also cost about $0.30 more. Now all songs are technically iTunes Plus songs, but your older songs need to be upgraded to get the new DRM niceness (along with the higher quality audio file). 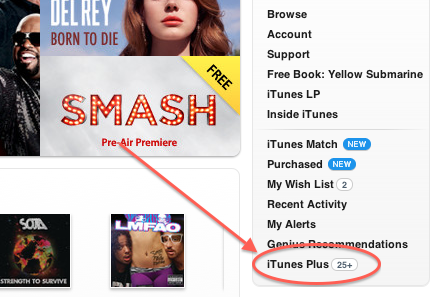 To find out about upgrading your older music files go to the iTunes store and click on the "iTunes Plus" button. Of course there always is the CD method, but I didn't suggest that.